22 years ago (! 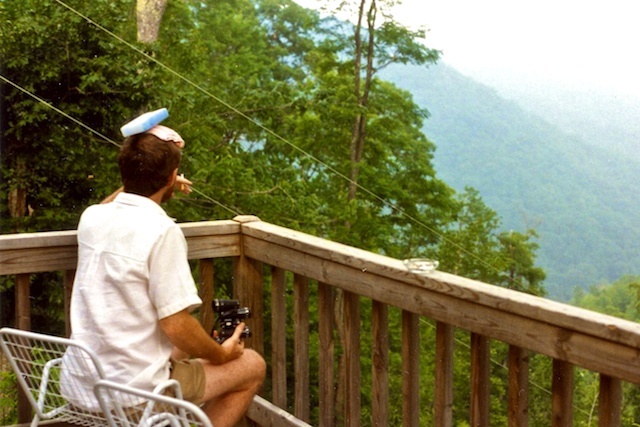 ), in what now seems like a previous life, I took my family on vacation to a cabin near the Great Smokey National Park. We shared the cabin with my good friend George and his family. Things did not go smoothly. Blood was shed on multiple occasions and I will never forget a wild ride down the mountain trying to keep the ambulance in sight. But that’s the subject for a different post. This post concerns what we now refer to as “George Moments”. If you are familiar with the GSMNP, you will be aware that quite often there are scenic pullovers. George finds it impossible to pass these by, but rather he MUST stop at each one, gaze about and snap some photos. It makes for, shall we say, lengthy journeys. When my bride and I went to Ireland on our honeymoon I took my new Minolta digital camera. We drove the SW of Ireland for 13 days (a different stop almost every night, which we won’t do again) and during that time I took about 1500 photos. We would be driving along, I’d see a beautiful sight and I’d HAVE to pull over to capture it. After a short ride up the road I’d see another beautiful or interesting sight and pull over again. Repeat. And repeat again. For 13 days. These quickly became referred to as “George Moments”. We’d be riding down the road and I’d holler “George Moment” and two things would happen simultaneously: I’d start looking for a place to pull over and there would be a rolling of eyes from the navigator. The sigh was optional. I took a bunch of grief from the navigator during this trip, but when we got home we had a nice, chronological collection of our trip. Even the navigator admits, reluctantly, that it turned out pretty well. (Site here) We have since had many George Moments in many different places. 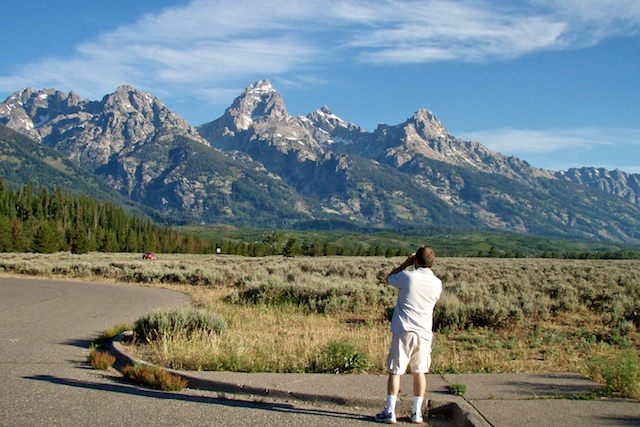 On our Montana trip we took our new point & shoot and the navigator took it upon herself to chronicle them. Smartass. Stay tuned for George Moments from Scotland. Above: George recovering from the first of several injuries sustained by multiple people during this trip. I can’t find the wider shot that includes the bottle of Cuervo next to the chair. Below: Part of the George Moment collection. Halfway through our trip to Scotland, on June 11, the World Cup of Football (Soccer to us unenlightened folk) will kick off. I’m sure that we will be exposed to the mania that is Football in the UK, particularly since the England vs. USA match is on Saturday the 12th. We will be on the Isle Of Skye that night and if history tells us anything it’s that we may well end up watching on the telly with some locals. Could be interesting. The last time we were in the UK, Ireland in ’03, there was another World Championship that we got caught up in. Our first night in country, in Galway, we stumbled into a mildly hip restaurant/bar for dinner. We were jet-lagged, suffering from sensory overload and ready for a relaxing dinner/drink. Our server (a nice girl from the States) seated us in the rear room which, due to the early hour, was mostly empty but for ourselves. Facing us was a television tuned to a snooker match. Now, we had no idea of the rules or what they were doing shooting pool with strangely colored (or coloured, as it were) balls, so we asked her if she could explain the rules. Being from the US she didn’t have a clue, but she called in the manager to help us out. He was very kind and gave us a 20 minute class in Snooker 101. He also explained that there was an Irish man, Ken Doherty that had a good chance of going all the way. 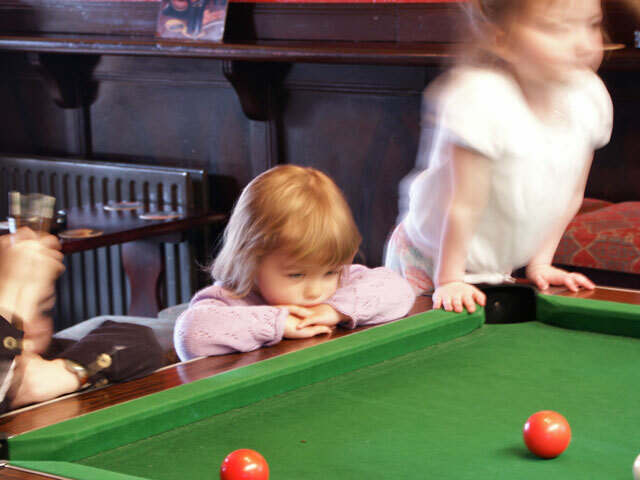 For the rest of our trip, in B&B’s and bars across SW Ireland we watched snooker. We actually started appreciating the nuances of the game, although to even explain the rules of the game now, 7 years later, would involve a trip to Wikipedia. One night in Killarney we staggered into our room for a rest before going out, turned on the TV and started watching the final…a match between the Irish guy (who, in very exciting fashion had made it this far) and a guy from Wales (Mark Williams). We never did go out that night. The match was fun, but Mr. Doherty came up short in the end and Wales took it. Now, tracking the Snooker World Championship was the last thing we expected to be doing on our honeymoon. But, really, isn’t the unplanned what quality travel is all about? Turning right into the unknown and discovering a several thousand year old ruin. Taking a shortcut that, after 45 minutes, brings you out 2 miles from where you started. Stopping for a drink and ending up chatting with Fiddler & Doogie, 2 obviously ex-IRA types (you can’t make this stuff up). At least we think they were “ex”. You can’t, and shouldn’t, plan for this stuff. It just happens. And it’s the stuff you remember years later like it’s yesterday. I wonder what we’ll remember from Scotland? BTW: The girl above was tormenting her older siblings & friends by randomly rolling the balls across the table when no one was looking. Kids are pretty much the same wherever you go. In preparation for the Scotland trip we have spent lots of time hitting the travel guides & I (JP) have been contemplating the map hung on the wall. All of the guides, when discussing driving about, talk at length about the fact that many roads are narrow. Very narrow. So narrow, in fact, that many of the “single carriageway” roads have pull-overs in order to allow two cars to pass. If the cars meet where there is no pull-over, there is a protocol as to who gets to back up; things like distance to the nearest one & how many cars are behind you. Not to worry, however. Our second day there we saw a road that headed out to the end of a peninsula. “Hey! Let’s go there.” It was very narrow, winding and had lots of ups and downs. Sharp drop-off on the left. We were impressed. And we needed a drink when we got back to the main road. But that was only the warm up. 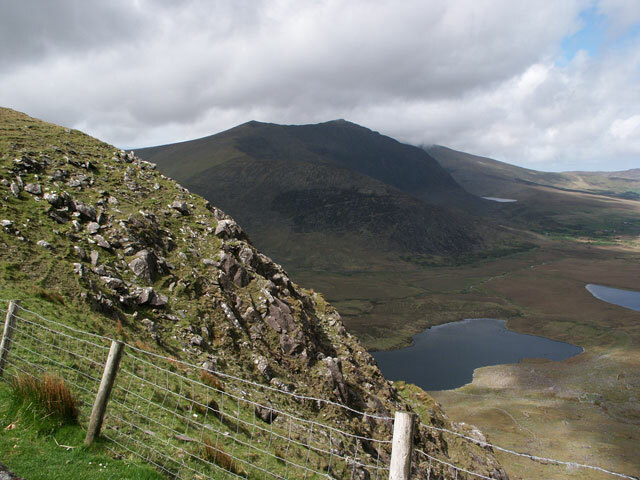 On the Dingle Peninsula we went across the Connor Pass. We had been warned to go from East to West in order to keep the car on the uphill side. Wise advice. Again, very narrow, VERY sharp drops on the right and it curved up and up. We were actually run into the ditch on our way up. That’s when I understood fully why the hubcaps were tie-wrapped on.